Chapter 5 is entitled, Habit Of Focus. Buy and read the book. You’ll get value from reading the stories that illustrate Ms. Joni’s points. 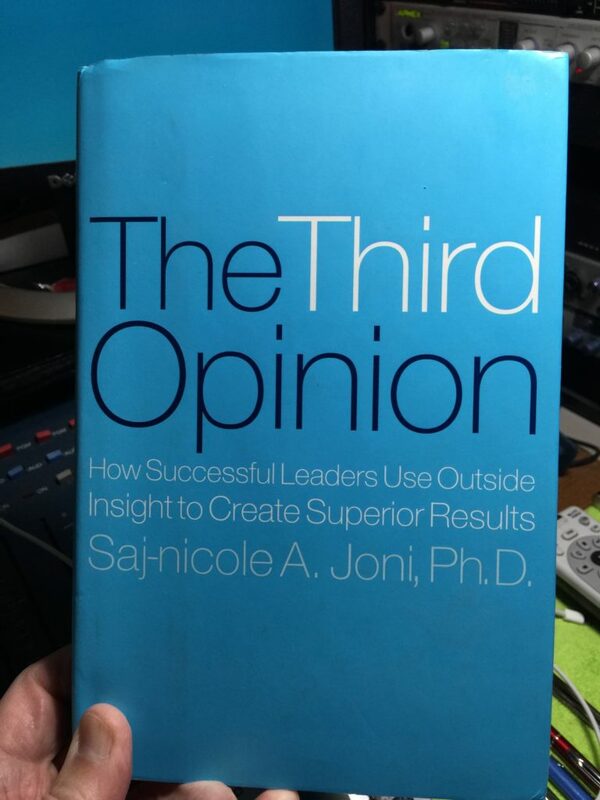 And you’ll be able to more deeply dive into the nuances of how the third opinion can improve your leadership (and decision-making). Let’s talk about the highlights of this chapter. The hardest part of leadership is keeping a sustained focus on what’s essential, not just what’s urgent. What will give us the biggest advantage? Where are our competitive threats? Leaders face many questions. Stephen Covey pointed out (in his book, Seven Habits of Highly Effective People) that if too much of your work is urgent, you’re not appropriately focused on what’s important. You’re just fighting fires. That resonates with most leaders. Mastering the habit of focus is the ability to move forward with important but non-urgent issues in a chaotic, high-pressure environment. Sustained focus on the non-urgent but important issues defines your unique contributions to your company and your ability to deliver value no one else can. Your ability to create value is what ultimately drives your career. You’ve got to devote your unscheduled time to the most important issues – the ones that hold the most potential for high returns over time. This includes systematic reflection on your resources. Effective leaders need time for reflection and inquiry. You’re responsible for your focus. Others may define a part – perhaps a significant part – of your schedule, but not all of it. Be thoughtful about your focus. How narrow or broadly am I thinking about my challenges? Would it be helpful to frame the key issues at several different levels? What is my time frame for this issues and why? Where does this issue fall in terms of importance and priority? What mental models and assumptions do I have that could affect how I frame this issue? What tools might I use to frame this issue and what are the limits of these tools? What’s known and not known about this issue? You also need a clear sense of what your overall leadership challenge looks like. With a sense of the whole you can develop a reasoned response. Ms. Joni has developed a trademarked technique she calls the star map of complexity. It helps you map and prioritize the issues so you can focus your time, resources and thinking partners properly. This chapter includes a diagram of this tool and advice on how you can use it. The author walks the reader through an actual leadership situation with Andy, who is facing some leadership challenges. She uses the Star of Complexity Map to help him figure out and implement improved focus. The diagrams, illustrations, and details require the reader to pay close attention. This material just doesn’t translate to a summary like I’m providing. You have to see it and digest it. As you might imagine, it’s fairly complex. Thankfully, the author does provide a summary of the process though, which will give you a taste of what this tool is designed to accomplish. Step 1 – Start your baseline Star Of Complexity Map by writing down your most important issues. Step 2 – Test your initial baseline map for completeness by considering metrics, assets, human dynamics, external conditions, and organizational structure. Add or change as needed. Step 3 – Complete the indices: Time Frame, Span, Interdependence, Stability, Criticality, Rate of Change. Step 4 – Draw the three lenses: Lens 1: Leader – Expert/Exponential/Time/Emotional Energy, Lens 2: Internal Team – Expert/Exponential/Structural Trust, and Lens 3: External Network – Expert/Exponential/Structural Trust. For each lens, what can you see about the strengths and weaknesses of yourself, your team and your network? Step 5 – With the star, the indices, and the lenses in hand, ask yourself the three Star Mapping Of Complexity questions: (a) What is most complex and challenging about your work? (b) What is most complex and challenging about your fit within that role? and (c) What is most complex and challenging about the way your role is influenced and shaped by others? Step 6 – Draw conclusions about your focus on exponential inquiry and your time and resources to do so. Assess your current inquiry circles and how you have them deployed. Where do you most need second and third opinions? Remember, Ms. Joni once served on the faculty of the applied mathematics department at M.I.T. It’s easy to see how she approaches these issues and fleshing out important details. While you may, or may not, be wired to approach issues in a similar way, don’t let the main point slide past you — how you spend your time on important, long-term strategic issues will define your leadership. That requires Habit Of Focus. How do these inner circle relationships progress through the stages of leadership: beginning with a first assignment as the head of a unit, to the stage of Key Leader, and finally achieving Senior Leadership at the top of an organization. You may or may not see direct application to your situation, but I’d urge you to still consider the path because it can help you better lead your people. Every CEO and business owners have direct reports who may experience these stages. Don’t dismiss it simply because you’re already at the top. The lessons are still valuable. Throughout the book the author continues to tell a variety of stories to illustrate the points. Again, we’ve not attempted to recite each of these. Instead, you’d be wise to read the book for yourself to take full advantage of the material. My hope is to spark your interest, give you an overview and provoke you to take some meaningful action to improve your leadership. This chapter is story intensive as the stories illustrate the full life cycle of outside insight and the power it has to strengthen leadership at several levels. They also raise issues about how and when to best create, guide, and nurture your advisory networks and teams. By now you should clearly recognize the power of these relationships on your own leadership. Care and feeding these relationships isn’t accidental. You want to take full advantage of them. You’ll have to behave with intention. Most leaders don’t think about their advisory network in a systematic way. It happens by accident or out of basic networking but doesn’t go beyond having a friend to call if you want to chat. Or knowing people you can trade favors with. Developing leaders probably inherited their action team. They may have a limited scope to change it or shape it. But your advisory network is one you’re fully empowered to create, staff and use. Populate it with people you really click with, people of the highest caliber, people with whom you’re committed to working with. What kind of contacts and networks have I built, and how and when do I use them? Are there teachers, mentors, friends, and activities that have been important in my development at some stage in my life? How do I include my spouse or significant other, family members, and personal friends in my current inner circle? When have I had a conversation or ongoing dialogue where I significantly changed my understanding or learned something I didn’t expect? What were the conditions and nature of the relationship that led to insight? Are there critical areas of inquiry for me now where I find I have no thinking partner, or where the thinking partners I have are lacking in expertise, perspective, or appropriate structural trust? Permit a bit of personal commentary. CEOs and business owners, more so than leaders at lower levels, often find it difficult to assemble an advisory board with enough diversity to provide exponential thinking – the ability to see the various sides of an issue. It’s understandable. For starters, there’s the issue of time. CEOs and business owners all lament, “I don’t have enough time.” Of course, rationally (and practically) they know they’ve got as much time as anybody else. That’s why that chapter on focus is so important. We make time for what we want. Too many top-level leaders (number 1’s) don’t see the true value of the third opinion that’s available through an advisory group. For the person who has the final authority in a business or organization, forming an effective advisory group simply isn’t practical. It’s certainly not easy. That contributes to some leaders denying the power of it. But that’s a cop-out. Cowardly. We all gravitate toward people most like us. Rarely do we intentionally try to interact or connect with people very different from us. Examine your connections. Your closest companions and advisors are likely quite congruent with how you see the world. Yes, you can behave more intentionally and surround yourself with more diversity, but it’s not easy. Or comfortable. And the odds of you taking the time to do that are slim and none. CEOs and business owners have bigger fish to fry, but no fish provides greater benefit to the #1 in helping them grow, improve and transform. CEOs and business owners who aren’t properly challenged never grow. Eventually, their effectiveness will fail. Grow or die is a truth. Who you surround yourself with matters. It’s a major value proposition of paid advisory groups where some third party assembles a group of peers who can come together, learn more about each other, learn about each other’s business and without any other agenda push each other to be better – more effective. It’s a purposeful and intentional assembling of CEOs and business owners who can look around the room and realize, “Everybody here gets me.” That’s a critical component of these groups. It’s why you find it so difficult to talk about your issues with anybody who isn’t a CEO or owner. They can’t possibly understand – not fully – what you’re going through. It’s the power of The Peer Advantage. It’s also why I’m on a mission to build just two such virtual groups of business owners. Visit ThePeerAdvantage.com for details. In the next chapter, chapter 7, the author will talk about early leaders. Again, don’t pass over that if you’re the CEO or business owner. You’ve got early leaders in your organization. You’ll serve them well by learning how they can leverage the third opinion.